Four years after a giant orange stadium appeared on their land, the inhabitants of Matsafeni village outside Nelspruit in South Africa say they are still waiting for their World Cup legacy. "They lied to us and betrayed us," said Imaan Milanzi, a community liaison officer, pointing to a muddy hole in the ground surrounded by rubbish, bushes and banana plants. Half a dozen people, holding battered old plastic paint tubs, had formed a casual queue, waiting for their turn to access the borehole - their one, trickling water supply. "Things didn't go as planned," said Mr Milanzi, of the local government's redevelopment plans. "They first promised to supply water, upgrade houses and roads. But they just built the stadium and disappeared." Image caption Nelspruit residents are disappointed that nothing else was developed except the "giraffe stadium"
The South African authorities spent some $2bn (£1,2bn) on infrastructure and other upgrades in order to host the 2010 World Cup - a tournament widely viewed at the time as a glorious, crime-free, profitable, reputation-changing, success. But four years on, what remains of the much-touted legacy, and what lessons could South Africa offer Brazil? "It was a success for Fifa and the corporate sponsors made a lot of money, but it left local businesses and the state floundering," said Johannesburg-based researcher Dale McKinley, pointing out that of the eight stadiums built or refurbished for the World Cup, only one - the iconic FNB stadium outside Soweto - "is financially viable". Indeed, campaigners are now demanding that the most expensive stadium, in Cape Town, be pulled down. The tournament did accelerate work on the Gautrain - the high-speed rail link between Johannesburg, its airport, and nearby Pretoria - and prompted some major motorway upgrades and a new bus system for Johannesburg. But critics say the Gautrain is priced out of the reach of most South Africans, and highly controversial new tolls on the motorways mean drivers are still paying for the renovations. "The infrastructure is good, but why was the money not used properly at the World Cup [so that we wouldn't be] left with these debts, and are now paying two or three times over again; and the prices of those services are beyond the means of a large percentage of our population which can't afford them," said Mr McKinley. The man who ran South Africa's World Cup, Danny Jordaan, concedes that the Nelspruit stadium - which cost three times the initial estimate and was surrounded by allegations of corruption and the subsequent murder of two whistle-blowers - still represents a "huge challenge". But sitting by the pitch inside an empty FNB stadium, Mr Jordaan told me that expectations about the impact of 30 days of football were unrealistic. "Even if Fifa gave us all the money it made, that's not going to address all the poverty and inequality" in South Africa, he argued. Besides, he said, the main aim and legacy of the tournament was to "rebrand" the country - and indeed the continent - as a "hopeful, rather than hopeless" place, in order to attract more tourism and foreign investment in the decades ahead. In that sense, Mr Jordaan said, the peaceful, profitable tournament had been "a triumph". Contemplating Brazil's experiences four years later, there is more than a hint of smugness among officials here. After all, chaotic, crime-ridden South Africa pulled off an impeccably organised, crime-free World Cup, with all its stadia ready long ahead of time. Mr Jordaan was critical of Brazil's slow infrastructure preparations, and of the lack of "competition" in the bidding process for a South American host nation. He said South Africa had been fortunate that its tournament had come after years of economic growth, which meant that "we did not have to move money from social investment". And yet, following the tournament, Fifa built just five mini-soccer pitches around South Africa as part of its promise to support the development of football. Mr McKinley described the legacy project as "a slap in the face". "A handful of projects were given World Cup money. They could have built a pitch in every school with the money they made. Why is Fifa so greedy?" At one pitch, on a hillside overlooking the township of Alexandra outside Johannesburg, children were getting lessons from volunteers on a recent afternoon after school. Fifa "did a good job", said Mooki Dube, programme officer at the Grassroot Soccer charity, which is now looking for new funders to support its work. "We appreciate what they did for us. But they could do more, and if they did do more, that would be welcome." Back in Nelspruit, I asked Mr Milanzi what advice he would have for Brazilians as they prepare for their World Cup. "I would say to them that they should just be careful not to accept anything that they hear from the officials," he said. "The officials are just there to make money from the stadiums and leave them in their current situation." 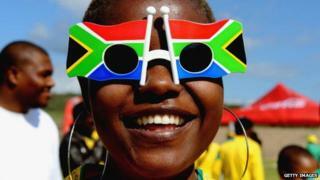 Video South Africa: Was it worth hosting the 2010 World Cup?